XL Studio 3.5 is ideal for direct marketing applications. Just import your data into Microsoft Excel®, set up an SMS message template and we will do the rest! The SMS plug-in will add the message to each of the mobile phone numbers in the list and send each of them the same or personalised text message. It's as easy as that, allowing you to contact large numbers of people in seconds. 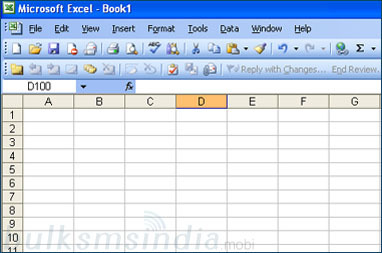 SMS plug-in for Excel is the easiest way to send out bulk SMS messages from a desktop application which most staff will likely be familiar with and have installed on their desktop PC's. This Plugin offers unmatched convenience by allowing its users to send personal customized messages to the recipients. For example if a Bank wants to remind its customers about payment of interest on a loan, it can send personalized bulk SMS by mentioning the name of each recipient with his/her amount due and payment due date. For example the message will be like - "Dear John, you have to pay an interest of Rs 9787 and the due date is 1st August, 2008." Add on feature of multiple scheduling helps customer to schedule different SMS on different date and time as per requirement. For example, if a Store using this feature wants to wish its customers on their birthday, he can simply schedule SMS on their date of birth through excel sheet only. SMS can be personalised and will be delivered on their birthdays. Similarly a bank or any financial institute can schedule their payment reminders or any other reminders or messages to different clients on different dates as per the requirement. Send high priority SMS without any additional cost. Simple and advanced sending options. Supports Microsoft Excel® 2000, 2003 and 2007 versions. Schedule your messages to be sent anytime in future. Schedule individual messages in one go. Example: If you have mobile numbers & birthdates in excel sheet, you can schedule your wishes to all of them in one click where receiver will receive the wish on his/her birthday.